PFP | What Does PFP Mean? PFP means "Picture for Proof". The abbreviation PFP signifies that the sender does not believe a claim made by the recipient. It is a request or demand for photographic evidence. PFP is often used between friends as a good-humored challenge to a status update on social media. Between lovers, it usually implies that the sender doesn't trust their partner and wants them to prove they are where they claim to be. When used during sexually-explicit online conversations, PFP is a request for pictorial proof that the recipient is doing what they say they're doing (e.g., sitting naked or lying in bed). Show me a picture and I will believe you. Luke: I'm wearing my fire fighter uniform. Jody: Are you teasing me? PFP please. Jordan: I've had a radical tattoo. Pete: I don't believe you. PFP. PFP represents a sentence fragment, also known as a minor clause or abbreviated clause. It is an incomplete sentence which still conveys meaning. 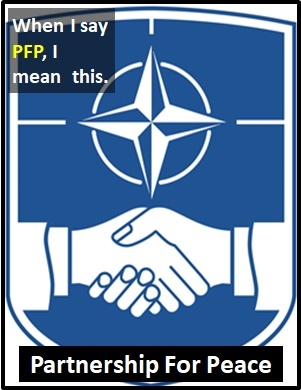 As it is pronounced using its individual letters (i.e., "Pee Eff Pee"), PFP is classified as an initialism abbreviation. Initialisms are different to acronyms, which are spoken like words. Before the digital era, we might have said something like "Show me a picture" instead of using PFP.